Do you ever wish you could plan a really fun art lesson for your kids, but feel like there's never enough time? You know your kids love art, and you know how important it is for them to have creative time to explore, but you just don't know where to start? If that sounds familiar, today's post is for YOU! Art History doesn't have to be time consuming and tedious. All you need are basic art supplies, and 5 minutes to google that day's topic and have a quick chat with your kids. Five minutes for you to get the kids started, and then 30 minutes (or more) for them to do their art. Go outside and paint or draw what you see. Look at the space from different angles before choosing where you'll set up your art area. For extra credit: Look at some Monet landscapes for inspiration. Open the cabinet, pantry, or fridge, and choose an interesting item to paint or draw. Use bold outlines and bright colors like Andy Warhol did in his Campbell's Soup Cans series. For extra credit: Do a series of 4 all using the same composition, but varying the color palette. Invite your kids to look in the mirror, and paint a self portrait. They can think about how they see themselves vs. what they think others see. For extra credit: Read: Frida Kahlo: The Artist Who Painted Herself by Margaret Frith. If the weather is warm, you can go outside and set up your drip paintings in a place that will be easy to hose down later. If you use washable tempera paint, it should be easy to clean up. On rainy days, this is a great project to try in the bathtub (just make sure your kids know the paint will make the tub slippery, so they should try to stay sitting, or kneel on their knees). For extra credit: discuss how non-representatinal art (like splattering paint) can help you to express your emotions. Take a look at the art of Mary Cassatt. She painted the same thing over and over again... moms with their kids. Ask your kids to remember a cozy moment that the two of you shared, and invite them to sketch it using chalk pastels. For extra credit: Invite your kids to keep their color palette soft, pastel, and kind of dreamy feeling... just like Mary Cassatt and the Impressionists did. Have your kids use markers to create their own version of Katsushika Hokusai's famous woodblock print. Ask them to pay special attention to the curves and points in the wave. Their drawing doesn't have to match... they can use their imagination to design their own waves! For extra credit: Play a cd of ocean sounds in the background as they create. Check out some of the murals Diego Rivera painted, and then invite your kids to go outside and create their own with sidewalk chalk on the patio. They may want to make a quick sketch of their idea, to make translating their ideas onto a large art area a little easier. This is a great spacial exercise, and is extra fun if multiple kids work on the mural together. For extra credit: Ask your kids to have their mural tell a story of something they recently read about or learned. Look at some of Degas' sculptures of ballerinas. There are LOTS to see. Then, give your kids a piece of modeling clay, and ask them to sculpt a dancer. It doesn't have to be a ballerina! If they like hip-hop, tap, ballroom, folk, or any other style of dance, they can sculpt a dancer in any pose they choose. The main idea is for them to look at some sort of reference, and use their observational skills to re-create the human body in that position. For extra credit: Snap a selfie of your child and their sculpture together, with them making the same pose as their art! 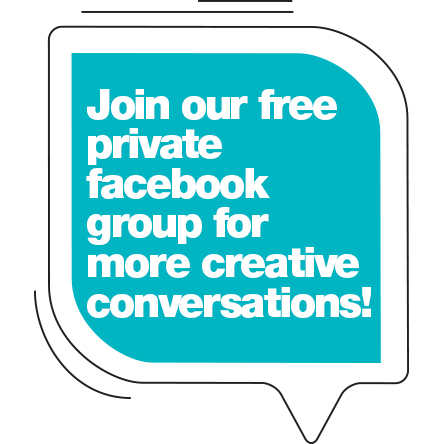 Then, post it to the Art History Kids private Facebook group or on instagram with #arthistorykids. Invite your kids to paint a dream they've had recently. For extra credit: Look at some surrealist artists like Magritte or Dali... they loved to paint their dreams! Get out a bunch of construction paper, and cut them into 3 different size squares... small, medium, and large. Start playing with them, and notice how the colors effects are altered depending on the colors that surround them. Look at 'Homage to the Square' by Josef Albers for inspiration. For extra credit: This project is even more fun if you use subtle color variations not found in most construction paper packs. Have your kids paint some color swatches with their own custom colors, or use some paint chip swatches from the hardware store if your have them leftover from a home decorating project. You can find a collection of downloads, activity guides, and fun project ideas in the Learning Library! Just download, print, and get the art party started. Play "Pin the Nose on the Picasso," explore pop art with Roy Lichtenstein's comic style imagery, or learn how to be an art history detective. Sign up here to get access to the full library of fun ideas to try! Sign up (and confirm your subscription) and the link and password will be emailed to instantly. You're just minutes away from your own personal art party! Thank you! Please check your email now to confirm your subscription. 10 projects you can get started in the next 5 minutes! They all leave room for individual expression, and your kids will explore their own creativity as the work on them. Let me know which ones your family enjoyed most! Join our Facebook group. I'm in there each day chatting with homeschool moms and teachers about all kinds of fun art topics, I'd love to chat with YOU!